When I want to give my children a treat, I bake them a big chocolate cake. When I want to show my children how much I love them, I’ll leave them in charge of decorating said chocolate cake. Et voila! 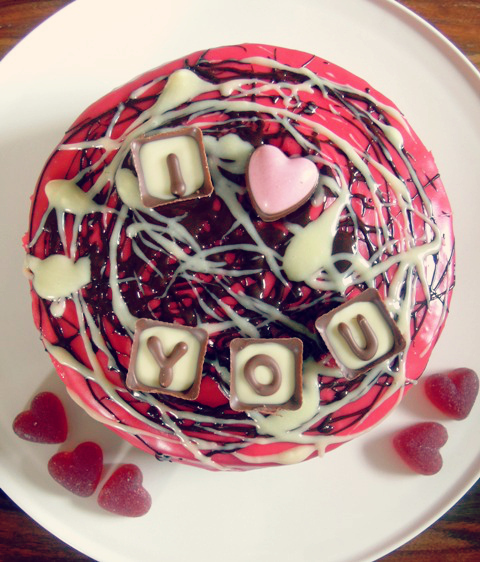 Here you have our Scribble Valentine Cake! Mia came up with the name. My daughters don’t think Valentine’s Day should be just for their mummy and daddy. Surely it’s a celebration for the whole family; we all love each other, don’t we? Especially when it usually means there are gifts of chocolates involved. So this year in the run up to V Day, we decided to make a rather large family chocolate cake. Yes, I know the end result is garish and gaudy but Mia had a blast being given (almost) free rein to decorate it, and all of us were more than happy to eat it. 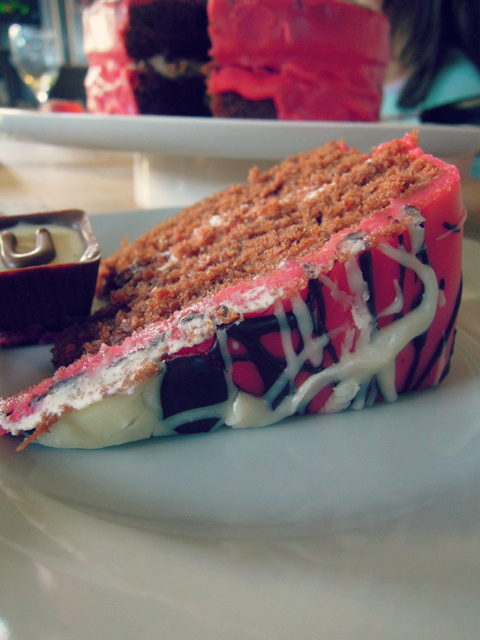 It is a simple chocolate sponge sandwich, filled with strawberry jam and whipped cream. 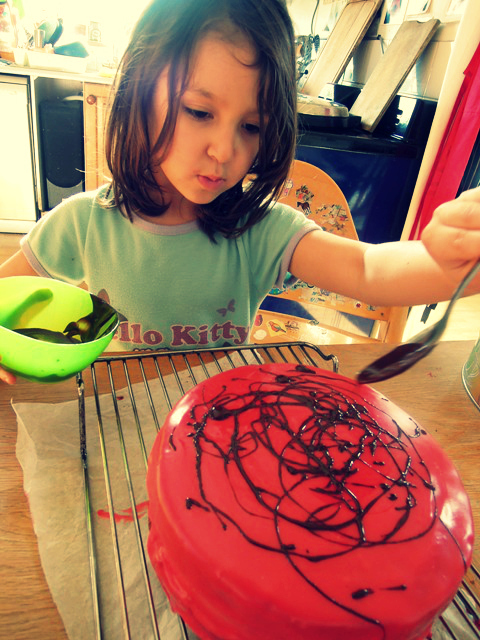 We then covered it with a white chocolate icing, which was supposed to be coloured a tasteful shade of pink but ended up a very vibrant red. I’d like to blame the children, but to be honest it was my hand that slipped as the food colouring went in. Mia then went to town creating her own Jackson Pollock style artwork, dribbling first melted plain and then white chocolate on top of the cake, and of course all over herself and the floor at the same time. For the final piece de resistance, Mia added some lovely Thornton’s Valentine’s chocolate truffle cups to spell out I heart you on top. We also had a bag of Thornton’s strawberry jelly hearts but Mia decided against using those as well at it might be slightly OTT. You see, she can be quite a discerning child really. Jess and Mia gobbled up the jelly hearts once they finished licking the bowl out, natch. If you’d like to attempt creating your own chocolate action art masterpiece with your little ones, here’s how we made ours. It’s a slight variation on the tried and tested chocolate cake I make for most special occasions in our house. Preheat the oven to 180°C/gas mark 4. Grease and line the base of two 20cm cake tins with baking parchment. In a cup mix the cocoa with 4 tablespoons of boiling water until smooth. In a large bowl, beat the sugar and butter until light and fluffy. Take some time with this; keep beating for a good five minutes. Add the cocoa mixture, eggs, flour and baking powder and mix well. Split the mixture between the two cake tins and bake for 20 to 25 minutes in the oven. The cakes are ready when an inserted skewer comes out clean. Allow to cool before removing the cakes from the tins. To make the icing, place the butter, white chocolate, icing sugar and double cream into a bowl and place over gently simmering water in a pan. Stir until it’s all melted and blended together. Add a few drops of red food colouring – just one or two if you want a pretty shade of pink, or a good glug if you fancy a slightly more vivid hue like ours. If the white chocolate goes a little lumpy or grainy, as it can do sometimes (white chocolate isn’t particularly easy to work with when it’s melted), you can try stirring in a touch more double cream and/or passing the icing through a sieve into another bowl. Allow the icing to cool a little. Remove the baking parchment from both cakes. Place one a wire rack, over kitchen towel or newspaper to catch the icing drips later. Firstly spread the cake with jam and then with whipped cream. Place the second sponge on top and press down. Pour the red icing over the top and allow to set slightly. In separate bowls, melt the white chocolate and plain chocolate and then, using a teaspoon, drizzle over the cake in an ‘artistic’ manner. Finally, decorate with any other sweeties or chocolates you fancy. 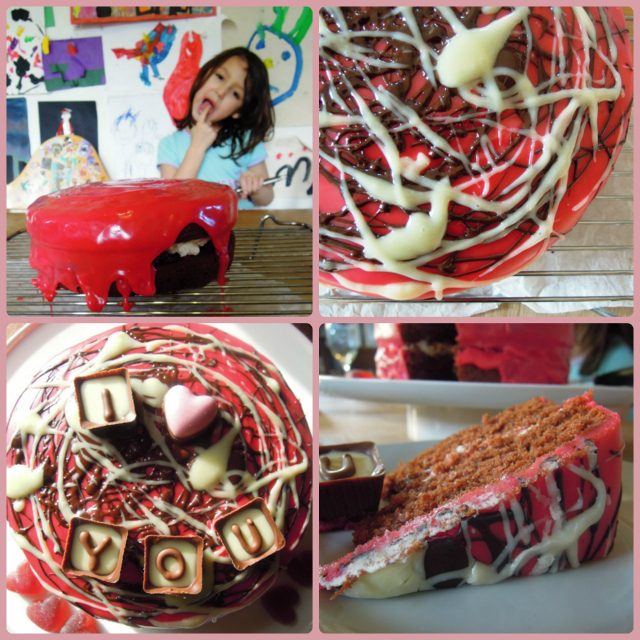 As this cake is definitely one to make for and with those you love, particularly those of the younger/smaller variety, I am entering it into February’s Family Foodies challenge hosted by Eat Your Veg and myself, and where the theme this month is LOVE. Disclosure: Thorntons provided me with complimentary chocolate truffle cups and strawberry jelly hearts for review purposes. LOVE the idea of giving the kids free rein over the decorations! My kids would be utterly delighted to do this too, bet yours had such fun, they certainly looked like it. And who doesn’t like choccie cake. Need to get myself into gear for my own monsters Valentines celebrations! Thanks so much for linking up to Family Foodies LOVE event. Love it. That kid is rocking! Fantastic decoration – it’s a bit of modern art. The cake looks fantastic. Your children have done a great job decorating the cake and I bet they had lots of fun too. Great art work and a very tasty sounding cake too. What an awesome cake! Looks delicious! what a lovely cake! I think v. day should definitely extend to family – and agree – if there’s chocolate involved I’m in! So pretty and a great name, I agree. My kids would have great fun with that! Love the finished cake. Such fun! Now I want a slice! It’s like modern art. I love it! That is simply genius! Mia is clearly a superb artist and cake decorator. Absolutely love it……… And yes, V day is definitely a family celebration in our house too!!!!! 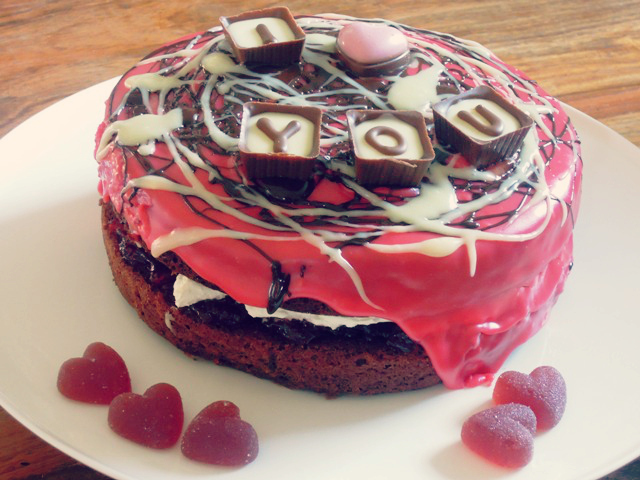 Cutest Valentine’s cake ever! Decoration is superb! A cake made with love and little fingers beats any elaborately decorated cake any day.This cake looks delicious. Wonderful cake! I love that you extend Valentine’s to the whole family – it absolutely is the way it should be!